Helping all homeless Veterans reach the same outcome Mr. Smith achieved with the help of Connections is the goal of the Delaware Challenge to End Veteran Homelessness. Today, the Delaware State Housing Authority and partners in the Challenge announced a progress update. Earlier this year, the state working group steering the effort used methodology developed by the Department of Veterans Affairs (VA) to estimate that 277 Veterans are expected to experience homelessness in Delaware in 2015. 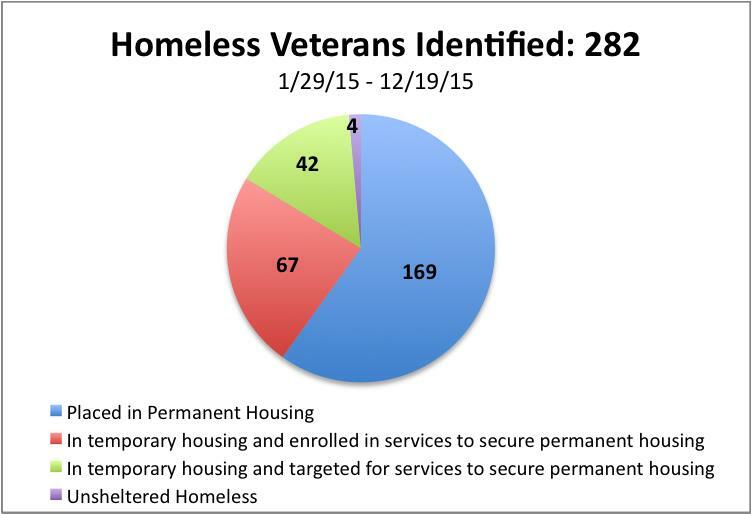 Since January 29, 2015, 282 homeless Veterans have been identified in Delaware. Two hundred seventy eight of these have been stabilized and are off the streets. Of these, 169 have been placed in permanent housing. One hundred nine are in temporary housing (emergency or transitional housing: still homeless by the U.S. Department of Housing and Urban Development (HUD)’s definition, but stabilized), and only four remain unsheltered. After announcing his intent to end homelessness among Veterans in Delaware in his State of the State Address, in May 2015 Governor Markell unveiled the State’s plan to achieve this goal and signed on to the national Challenge. A state working group brings together key state and federal partners and representatives from local committees on a monthly basis to steer and monitor progress on the statewide effort. Key partners include the Delaware Department of Health and Social Services, U.S. Department of Housing and Urban Development, U.S. Department of Veterans Affairs, Delaware Commission for Veterans Affairs, Homeless Planning Council of Delaware, Connections CSP, Veterans Multi-Service Center, all three counties in Delaware, and the cities of Wilmington, Newark, Dover, Seaford, Georgetown, Bridgeville, Greenwood, and Blades have also signed on. Local groups are working in all three counties on direct outreach and community mobilization. On October 23, Governor Markell and other officials announced several new initiatives to end Veteran homelessness in Delaware, including a statewide 100-day challenge to permanently house 96 homeless Veterans, starting October 23 and ending with the annual Point in Time study in late January, 2016. The Point in Time study is the process by which Veteran homelessness is measured nationally each year. 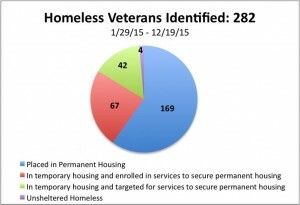 In the 100-day Challenge to date, 29 homeless Veterans have been placed in permanent housing. Also announced in October, the Veterans Count outreach event identified eight unsheltered homeless Veterans who had not been in contact with services previously and are now being engaged in services. On November 10, 11, and 12, volunteers statewide canvassed the state at 4:00 AM to seek and identify unsheltered homeless Veterans. The Challenge is not only about housing Veterans who are currently homeless, but putting the systems in place to ensure that Veterans who become homeless in the future are quickly connected to permanent housing, resources are available to house them, and homeless Veterans do not fall through cracks between the VA and mainstream systems. Many such system changes are underway in Delaware, to ensure the commitment to end Veteran homelessness is not just temporary but permanent.